Jersey City, NJ, September 20, 2014 – Charity Footprints recently completed a first-of-its-kind global, ‘decentralized’ 5K to raise funds for Sankara Eye Foundation, a US-based non-profit organization that works toward eliminating curable blindness in India. The 5K event was powered by the Charity Footprints mobile app which allows users to set distance goals, invite people from their social circles to sponsor those goals, and track workouts using the GPS technology on mobile devices. Once the fitness goal is completed, an automated payment system pools sponsorship pledges and sends them to the non-profit organizations associated with each particular goal. The Footprints for Sankara 5K event had over 337 participants walking in 90 cities across 13 countries and 4 continents. 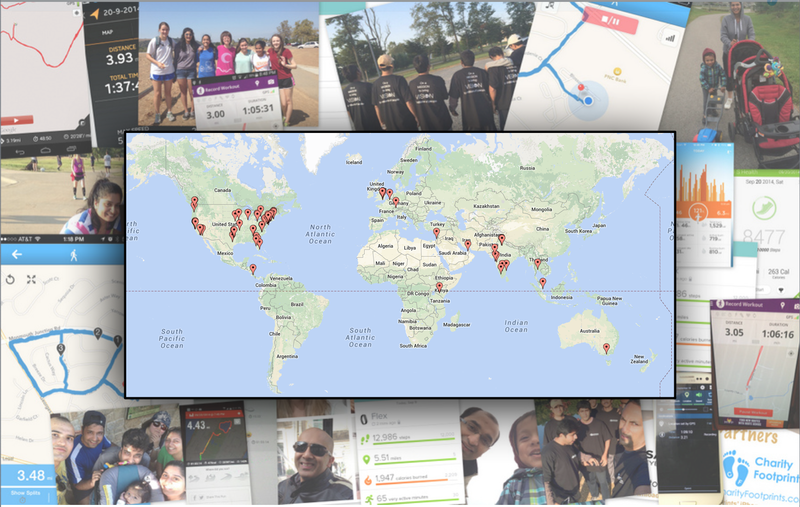 Participants walked/ran using the Charity Footprints mobile app on September 20. Participants leveraged the Individual/Team Goal options on the application to participate individually as well as in small groups of 5-15 to walk and raise funds. Participants raised over $15,500 in a single day and funded more than 500 free eye surgeries (1 eye surgery = 30$). Of the event’s success, Sankara Eye Foundation, US CEO Murali Krishnamurthy said, “The response to the Footprints4SEF 5K has been overwhelming, and we are very excited to partner with Charity Footprints in many more events in the future to mobilize and connect with our supporters around the world”. Charity Footprints founder Rahul Razdan said, “We are thrilled with the success of Footprints4Sankara 5K event and would like to congratulate the real champions of the event i.e. Sankara volunteers who walked and ran across 90 cities, 13 countries and 4 continents. Our vision has always been to connect people all over the world and motivate them to be active and generous. Our mobile platform as an enabler makes the whole experience more fun and engaging for the participants, and reduces the event management costs significantly for the non-profits”. Charity Footprints is a mission driven organization with a vision to make the world a healthier, more generous, and more community-oriented place. Our mobile app links personal fitness to charitable giving — turning the typical fitness-tracking app into a fundraising platform that has access to over a million non-profit organizations. Sankara Eye Foundation USA, is a US-based non-profit organization that works toward eliminating curable blindness in India.